Mother Nature treated us to a few​ warmer days, and that has made me anxious for patio weather. I look forward to coffee in the morning with the birds and lunch while watching the pups chase squirrels. However, my favorite patio events may be casual entertaining with friends. A few cool beverages and a couple of snacks paired with interesting conversation always rejuvenate me. Bowls of chips and salsa and platters of cheese and crackers are good sustenance for our get-togethers, but fresh vegetables and dip are also a refreshing option. My favorites are Dill Dip or a hearty hummus, but I recently added a new dip to my repertoire — Wasabi Pea Dip. Just like those famous crunchy snacks, this has a flavorful horseradish-like bite. Its creaminess depends on how much or how little you choose to process the ingredients. I prefer a little texture. Parsley and lime balance the sweetness of the peas and provide an overall zippiness. I haven't met a vegetable that wasn't enhanced by dunking into a bowl of this bold green sauce, and it is so simple to whip up that my focus can remain with the companionship of my friends. 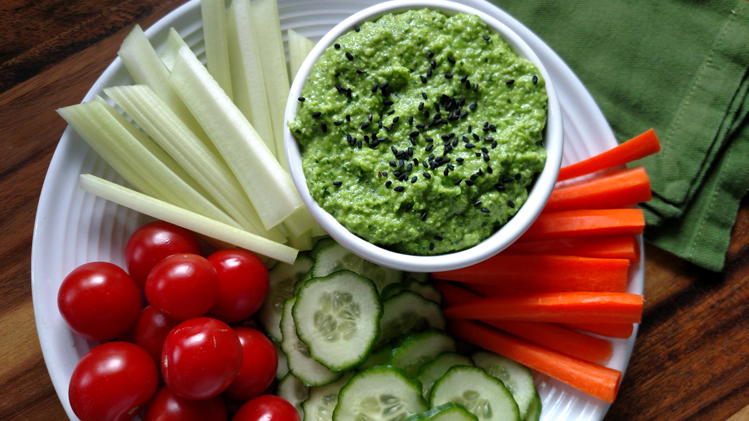 Wasabi Pea Dip is a stress-free addition to spring and the coming summer. Pair wasabi with fresh garden peas for a zippy summer dip. Looks yummy Fran! On a scale of 1-10, how spicy is this dip? I usually stay away from anything wasabi because you never know. But, I do love horseradish! Really, it is only as spicy as you make it. The wasabi paste comes in a tube. If you are fearful, start with just a pea-sized dab and add more to suit your taste. When I made the recipe with just the 1/2 teaspoon of wasabi paste, I felt the heat was more of a slight after bite and not really spicy at all. Last time, I didn't measure and added a huge squeeze of the paste. That was a sinus clearing dip.